Special Containment Procedures: SCP-2633 instances are to be contained in specialized semi-aquatic zoological containment chambers in the arthropoid wing at Area-12. Atmospheric conditions are to be monitored closely. Any personnel that need to operate in close physical proximity to SCP-2633 instances are to wear appropriate respiratory protection. Description: SCP-2633 refers to five individual Johngarthia lagostoma crabs1. Instances are physiologically identical to non-anomalous members of the species. Anomalous properties manifest at a molecular level, during the process of cellular respiration. Through an as of yet unknown process, each SCP-2633 instance produces a number of substances in place of the carbon dioxide that would normally be produced. Instances also conduct respiration at a rate considerably greater than normal, producing as much as four liters of gases every thirty minutes. SCP-2633-2 produces cannabidiol and tetrahydrocannabinol. SCP-2633-3 produces morphine, codeine, thebaine, noscapine, and papaverine. SCP-2633-5 produces water, vegetable glycerin, propylene glycol, and a substance compositionally similar to apple byproducts. It is not currently understood how SCP-2633 instances are apparently unaffected by the substances they produce, which would typically be lethal to invertebrates of a similar size. Non-invasive tissue samples have been collected from each of the five instances, and are currently being analyzed to determine possible mechanisms behind anomalous cellular processes. SCP-2633 instances are also exceptionally long lived, having survived well over 200 years. Though first reported in 1773, SCP-2633-1, -2, and -3 were first confirmably discovered on Ascension Island2 in 1815, several weeks after the first British settlers arrived there3. Said settlers captured and made recreational use of the instances for several years before they were taken by Governor Mark Wilks4 in 1818, and presented as a gift to King George III, who maintained possession until his death in 1820. The instances changed hands several times over the next 191 years (notably making it as far as Istanbul, Mumbai, and Khanbaliq) before being obtained by Marshall, Carter, and Dark, Ltd.. Objects were finally contained by Foundation personnel following a 2011 raid on a MC&D warehouse by Mobile Task Force Mu-3 (“Highest Bidders”), along with several other objects. Instances were relocated to Area-12 to join SCP-2633-4 in containment. SCP-2633-4 was first discovered in 1997, though is believed to be responsible for a number of reports of delusions and erratic behavior among allied soldiers stationed on Ascension Island during World War II. Though not in Foundation possession at the time, SCP-2633-1, -2, and -3 were known to the Foundation, and a containment team was dispatched from Key Largo to retrieve SCP-2633-4 due to its similarities to prior instances. SCP-2633-4 was not properly stored for the return voyage, and the entities psychoactive effects resulted in the plane crashing into the ocean approximately 900 kilometers north of Hispaniola, causing the deaths of 8 personnel and the loss of SCP-2633-4. SCP-2633-4 (or an entity with an identical anomalous properties) was rediscovered by civilians in 2002, on a public beach in Miami, Florida, causing an episode of mass delusions5. Local authorities were called in to handle the incident, while Foundation personnel were mobilized to contain SCP-2633-4. SCP-2633-4 was contained at Site-63 for the next 8 years, until it was transferred to the parazoology department at Area-12 in 2010. SCP-2633-5 is the most recent instance, found on Ascension Island on 11/11/2016. The instance was kept as a pet by a local family for three months, before a social media post featuring the instance was flagged by Foundation detection algorithms. SCP-2633-5 was then apprehended by a containment team, and the family was treated with Class-B amnestics. Based on documents recovered during the aforementioned MC&D warehouse raid (see below), it is currently believed that the first three SCP-2633 instances were created as an attempt by the British East India Company to create a method to efficiently and surreptitiously transport large quantities of narcotics into China. The methods used for this purpose are not yet known, though an enhanced breeding and genetic alteration program has been authorized to attempt to replicate SCP-2633’s anomalous properties using both SCP-2633 instances and non-anomalous stock of J. lagostoma. This project will be overseen by Dr. Hendricks. Below is a transcription of Document-2633-2, obtained with Marshall, Carter, and Dark documentation of SCP-2633. As you are aware, my Providence was tasked with carrying the experiments back to Calcutta. I am afraid I must report that I am unable to abide their presence on my ship. The native you had me purchase them from has warned me of the creatures’ potency, but I had not understood his meaning. Six times now my men have absconded with the beasts, and their foul fumes are inhibiting any work being done aboard. Because of this, I must confess that I have thrown the animals into the sea, much to the chagrin of my men. I hope the company will not be too put off by my transgression, I do not believe the creatures were worth what I daresay was a sizeable price, nor would they have gotten past the Chinese. The port authorities know their crabs, and can smell the poppy a mile off. Perhaps something larger and more amicable? Dogs, perhaps? We will be making port in Abidjan, where I hope to send this missive to you, to pick up the shipment of ivory, and then we sail to Bengal, where hopefully we can speak of this further. The above letter is believed to have been written in 1773 to Warren Hastings, a member of the East India Company’s governing council by Captain Rudolph Brooks, a seaman under the employ of the EIC, often charged with moving cargo of an anomalous manner. It should be noted that over a period of approximately 20 years (1840-1860) numerous reports were made of British vessels carrying “poppy hounds”. Whether these animals represent continued efforts on the part of the East India Company to continue the experiments that yielded SCP-2633 is unknown at this time. Additionally, research is currently underway to determine the identity of the "native" mentioned by Captain Brooks in the above letter. SCP-2633-4 and -5 are currently theorized to be offspring of SCP-2633-2 (the only female of the group) and one or both of the other two original instances (or possibly non-anomalous J. lagostoma). How SCP-2633-4 and 5’s products were determined is still a matter of much speculation. Addendum: Results of SCP-2633 breeding program, updated 1/23/2017. 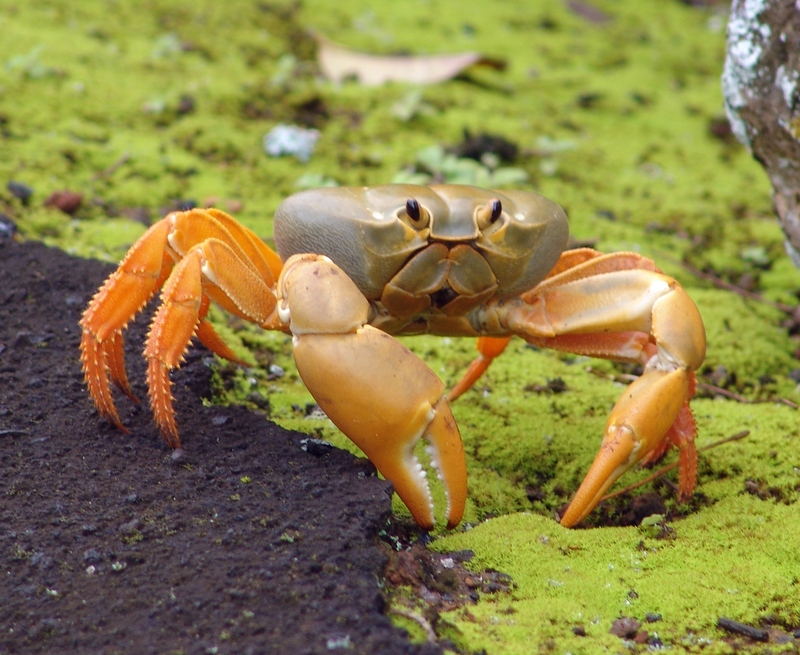 SCP-2633 instances have thus far refused to interbreed, though two broods of anomalous offspring have been produced as follows: A cross of SCP-2633-3 with a non-anomalous female crab has yielded an entire brood (approximately 100,000 individuals) whose blood and bodily fluids contain dimethyltryptamine in very high concentrations. 60 female larvae were allowed to mature, and are currently being kept in containment at Area-12, the rest were flashfrozen and are kept in refrigerated storage below Site-83. Additionally, a recent brood resulting from a cross of SCP-2633-4 and a non-anomalous female crab has yielded an additional approximate 100,000 larvae, roughly 3% of which have exoskeletons largely composed of crystalline N-methylamphetamine. 2000 larvae are being allowed to mature to assess potential further anomalous properties, and the remaining ~98,000 were frozen and stored below Site-83. 1. Terrestrial crab species native to four small islands in the South Atlantic. 2. A small volcanic island in the South Atlantic, currently occupied as a territory of the United Kingdom. 4. Governor of Saint Helena, a title which also oversees governance of Ascension Island and several other small neighboring islands.